Tweets of the Week: Sweeter than discount Nutella! Oh, wow, we have a packed TWEETS this week! We’re starting a #LetAquaBlueRide campaign. We’ve got a Pope, Nutella chaos, a Vegemite challenge and the world’s most expensive cup of instant (blech!) coffee. We have some race winners, hospital reports, some serious words about what sport can be and finish it off with a true hero. It’s a mixed bag of awesomeness! Let’s go! Every day we hear about cyclists being hit by cars, vans, trucks, whether on their commute into work, on a weekend ride or even on a training ride with a pro team. Of course, we can never forget that this is how Michele Scarponi died last year. Unfortunately, we had another big incident between bikes and trucks in South Africa with the Quick-Step team that put Laurens De Plus and Petr Vakoc in hospital. Luckily, both are on the mend. Join us in wishing them a fast recovery! We want to thank everyone – fans, teams, riders – for your support and words of encouragement! It meant a lot for us in these trying times. My personal opinion and personal opinion only! On the last days and security on the road in general! Happy to share with you that my appetite is healthy already! Very grateful for the incredible amount of support I have been receiving. Especially from @koenpelgrim1 @bobjungels @laurensdeplus & Peter de Conick who are here and the whole @quickstep_team. I have already felt like having my family here even before my mum and bro @mvakoc made the long trip here. Huge thanks to the medical staff of the hospital and ambulance who have been doing amazing job, many kind people who were around and our hosts at @hopshollow who have been taking perfect care of us since we arrived and on top of it sent this amazing carrot cake. I have been overwhelmed by the amount of messages and encouragement I have received from all of you! Thank you! I really appreciate it! AquaBlue, who did such a great job animating all the WorldTour races they were in last year, have been overlooked (to put it mildly) when it came to wild card distribution so far in 2018. Cillian wrote this before it was announced that they had, in fact, got into a Monument – Liege-Bastogne-Liege. But no Grand Tour … that is so disappointing – for both the team and the many fans they’ve won. We say #LetAquaBlueRide! Aqua Blue struggling to get invites to big races this year. No Grand Tour, Monument, Paris-Nice or Tirreno so far. That's so disappointing. Did they shake someone's cart too much? I was wondering the same thing. They've an invite to LBL and that's it. More competition in the PC ranks, yet they held their own last year and I expected more for them. Knowledge is knowing Nutella is pronounced 'new teller'. Wisdom is never, ever pronouncing it 'new teller'. Come at me. I'm on this righteous hill and I'm not backing down. Nutella is gross. I’m not a Nutella fan, myself. But I could get on board with these recipes, I think. Just when you thought pancakes couldn't get any better. Here’s hoping this is just the start of winning ways for The Mighty Degs this season. Yeah baby! El del @TrekSegafredo gana el Trofeo Playa de Palma – Palma!!! Wise words from John Amaechi about what sport can be – and what it’s not. I love this photo from Marshall Kappel – the colours are so sharp and rich. I’m SO ready for the Classics this year. #BestOf / La Belgique et notamment les Flandres en une image. It might not have anything to do with cycling, but it’s definitely worth a place in Tweets. Always love seeing a rider taking time out to make a young fan’s day. SpokeyDokey‘s response to this really made me laugh. Gianni Moscon seems a bit ambitious this season. Yet, at the time of writing, he’s still waiting to hear if he’s going to get a ban after his referral to the UCI Disciplinary Commission over Sebastien Reichenbach‘s crash last season. Oh, Schengen, we love you so …. before you came along, we had this. Big day today for the Pope. 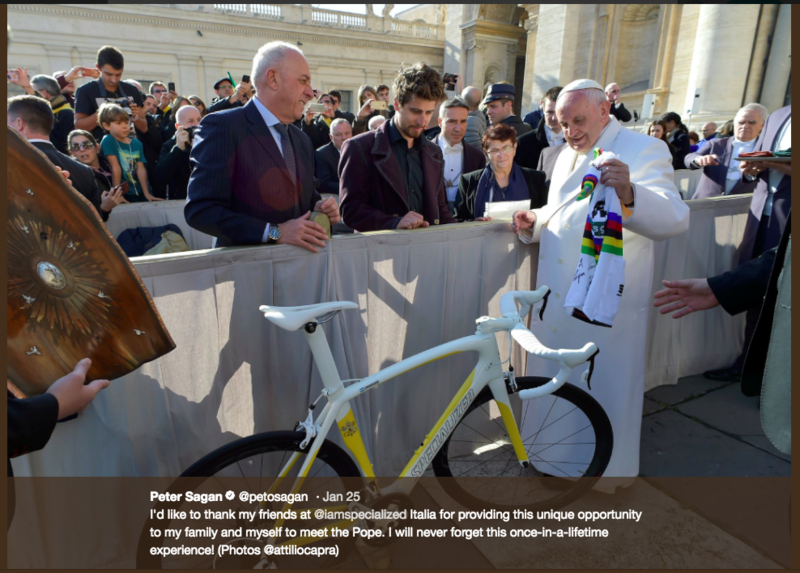 He will meet Peter Sagan. "Why does Holland have one of the lowest obesity rates? Reactions to the KidneyDefence keep rolling in. While every cloud has a silver lining, at least for David de la Cruz – is this a masterclass in trolling or just serendipitous. Liking this Swedish national jersey. I might just start a green energy company called Gorilla Power. So. I got lost on my ride home today after the press conference. Stopped a local who happened to be a fellow cyclist who was watching the rave and guided me home. Bora has thrown down the gauntlet for the season, it seems. Sagan scoops a stage and a jersey at TDU, Bennett takes a sprint at Cadel Evans GP and McCarthy claims line honours at the road race proper. Hell of a season start for Bora-hansgrohe in Australia. Gino Bartali was a great cyclist. But an even greater person. Someone who put others’ safety and survival before his own. Who fought racism and injustice with the weapons that he had – his bike and his courage. We can all be a bit more Bartali. Next PostTweets of the Week: Little Kangaroo’s return! The pox is back! Cobbles soon!